If Cruise 'Abandoned' Suri, What Have Military Fathers Done? In a deposition for the lawsuit against the tabloids, Cruise likened his job and his time overseas to that of a soldier leaving his family behind to serve in Afghanistan. A collective gasp could be heard across the military community. Maverick! Ever since Top Gun, many military families have wanted to cheer for Tom Cruise. He was somewhat like an honorary member of our group. Then, through the couch-hopping, Scientology days, we struggled with our feelings ("No, Maverick, stop! Stop jumping on that couch!"). Sometimes, Cruise's behavior was unfit for the officer he played on the big screen, and the military community cringed. But in recent weeks, Cruise seemed to be making a turn for the better. There were reports of tabloids claiming he abandoned his daughter, Suri, while filming movies overseas, and military spouses rallied behind Cruise's defense that being physically absent from a child does not necessarily equal abandoning them. As a military dependent for more than 37 years, I can vouch for that. I was born during my Navy-dad's first six-month deployment, and by the time I turned 22, he had accumulated 11 years of sea time. He had literally been gone half my life. Although I sometimes resented the fact my dad was gone so much, I never felt abandoned. Dad sent letters (this was before email and Skype) and gifts, and my brothers and I knew that being away was part of Dad's job. We accepted it. Today, I'm married to a Navy pilot and raising three military children of my own. 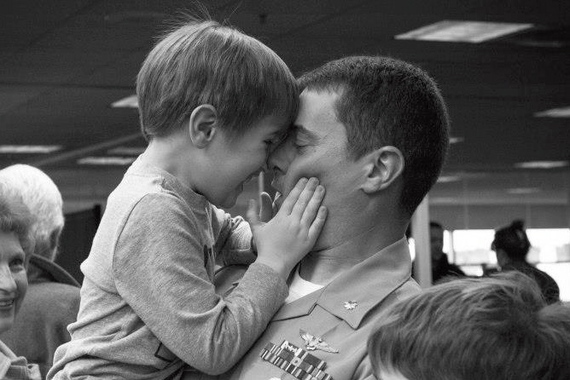 Last year, my husband returned from a 13-month deployment overseas, longer than any deployment I experienced with my dad, and still, the kids were not abandoned. They know their dad loves them, that he is working to provide for their future and that being in the military means being deployed. I suspect there are plenty of children who do not enjoy this support (i.e., they feel abandoned) even though their dads are in the country, or even in the same home. So, as a military child, spouse and mother, I was with Cruise again. He "got" it, and he was going to prove his point to the tabloids. Then came this: In a deposition for the lawsuit against the tabloids, Cruise likened his job and his time overseas to that of a soldier leaving his family behind to serve in Afghanistan. A collective gasp could be heard across the military community. Maverick! Deployed service members don't make an actor's paycheck. Deployed service members cannot come home for birthdays, anniversaries, holidays or funerals. Deployed service members must wait for Uncle Sam to agree to send them home and to arrange a flight (usually not commercial; certainly not first class). Deployed service members sometimes have unreliable access to phones, email and Skype. And, most important, deployed service members are often in life-or-death situations. All of the above is why Cruise's movie-making stints overseas cannot be compared to a military deployment. All of the above is why military spouses were offended that he tried to. Yet, for those who have never experienced a military deployment, there is understandably some confusion about what it really means for the family left behind. In this way, maybe we can give Cruise the benefit of the doubt and use his faux pas as an opportunity to enlighten others. During my husband's last deployment, we invited people (U.S. Senators, congressmen, governors, artists, authors, musicians) to "fill" the empty seat at our table and show them what life as a military family is really like. We called it Dinner with the Smileys. Our guests usually left with a profound new understanding of what military sacrifice is. They were sitting in my husband's chair and talking to his wife and children about their day, things my husband wouldn't be able to do again for months. In other words, by sitting in the empty chair, my husband's (and thereby service member's everywhere) absence became more present. If Mr. Cruise would like a crash-course in all things military again, we have an open seat for him. Most of our dinner guests bring dessert, but, hey, Cruise could bring Suri. It might be good father-daughter time.